Comparison tests for sharpness between a Panasonic GH2 fitted with a Voigtlander 25mm f/0.95 Nokton and a Leica M9 fitted with a Zeiss 50mm f/2 Planar. After doing the first test, I realised that the comparison may have been a little unfair. For my landscape work f/8 f/11 and f/16 are the apertures I would use most on the Leica M9. This was one of the reasons I used this as my comparison aperture. However with m4/3, wider apertures will provide more depth of field than their full-frame counterparts and many m4/3 lenses perform at their best before even reaching f/8. I did two more tests. 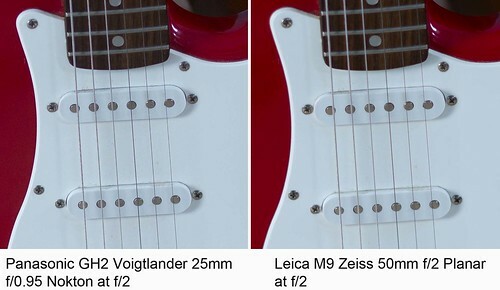 The first involved comparing the GH2 plus Voigtlander 25mm and the M9 fitted with the Zeiss 50mm at f/2. 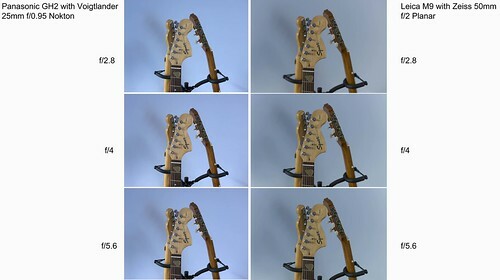 The GH2 combination has more depth of field at f/2 so it may appear sharper, but at the point of focus (the guitar pickups) this is a much closer result. In fact if it wasn't for the depth of field indicating which was which I don't think I could tell the difference. The following was comparison at f/2.8, f/4 and f/5.6. If you click through to flickr on this file there is a very large file available to view. This is quite astonishing as again the difference is minimal and its very difficult to see any difference in sharpness. Perhaps the Leica combination just shades it but its really very close indeed. Some words of caution - It is very difficult to set up a "scientific" type comparison, at least with what I have at my disposal. The ratios of the two are different and there is the full-frame - 4/3 sensor size difference. There's also obviously a difference in how the two cameras render colour balance. The Leica is the more accurate by the way. It's also interesting to see how the Leica files have survived the heavy jpg compression worse than the Panasonic files. I also shot both sets at ISO 160, the highest quality setting on both cameras. Neither cameras are world beaters in terms of high ISO noise though the GH2 is a great improvement on previous m4/3 cameras and I suspect would win any comparison on the noise front. But thats not what I want a Leica for. However having said all that - I was surprised how at these wider apertures there is such a similarity. Both sets of images are very sharp and I've often said that the M9 produces the sharpest files of any camera I've ever used, and the sharpest I've ever seen outside of medium format digital. That the GH2 could get so close and equal this when fitted with the Voigtlander lens is remarkable. 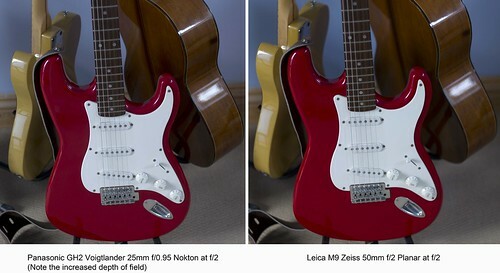 As far as I know the GH2 has an anti-aliasing filter fitted so this makes it even more impressive. I did some tests with a Voigtlander 35mm f1.4 fitted to the Leica compared with both the Panasonic 20mm f/1.7 and Olympus 9-18mm fitted to the GH2. I did these at f/11 again and the Leica combination was obviously sharper. I'm going to do this test again at wider apertures to see what results I get. The primary aim of this is to establish whether it is the Voigtlander lens that is the main cause of this or the GH2 sensor. Since getting the GH2 I have used no other camera. I have been seriously impressed with the results I've been getting. It had crossed my mind that what I was seeing on my screen was very close to what I would expect from the Leica M9 and the fact that I'm taking advantage of the terrible weather outside to edit lots of images from different cameras has made me aware of that. However I haven't as yet worked with the Voigtlander outdoors in a "real-world" situation. Manually focusing a metal lens outdoors in the current temperatures we're experiencing in the UK at the moment is both difficult and unpleasant. Its also impossible in gloves which is what I'm wearing. Therefore the results that I have been looking at are GH2 images taken with mostly the m4/3 and 4/3 zooms I have. These are very good indeed but comparing them with shots taken on the M9 the Leica has produced sharper results. However I will use the GH2/Nokton combination outdoors and report back on what I get.